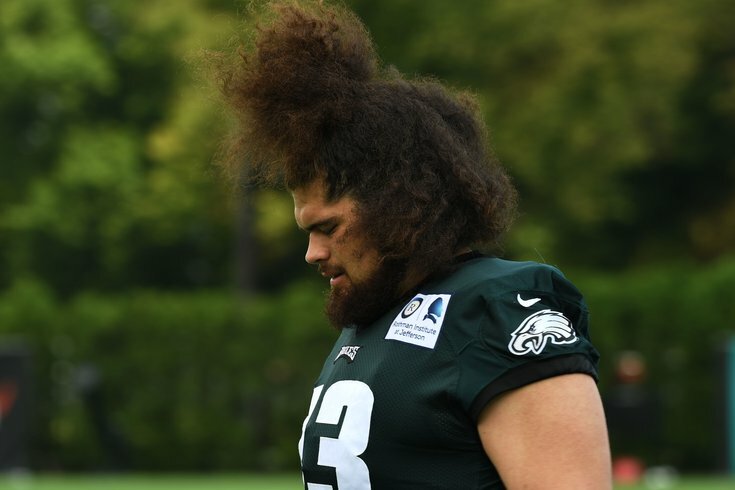 Here's a picture of Isaac Seumalo for no reason whatsoever. They're just going to be replaced with more notes after tomorrow morning's practice anyway. The players practiced in pads, but action was less intense, as a slew of players got a breaks from the action. It was probably the sloppiest Eagles practice so far this camp. I flew back from Canton today, wrote all day, and then covered a night practice. I'm tired. • Carson Wentz practiced, and participated in 7-on-7's, but did not appear in 11-on-11's. So there's your update on him. • Nate Sudfeld had a nice pass to Agholor down the sideline in between Malcolm Jenkins and Rodney McLeod. Otherwise, he had a bad day, as his accuracy in the short and intermediate parts of the field was problematic. The lowlight of the night was a way off-target throw over the middle that was picked by Jordan Hicks. Sudfeld has tools. He's smart, he has a good arm, and decent mobility. Sometimes those tools result in really good-looking throws, but he needs more consistency. He'll be an interesting player to watch in the preseason games. • Kamu Grugier-Hill also picked off Sudfeld on an impressive read in which he jumped an underneath route. If I'm Jim Schwartz, Kamu is the leader right now for the WILL linebacker spot. • Donnel Pumphrey got wide open in the corner of the end zone, but had a ball sail right through his hands. I would say he's in the lead for the fourth running back spot, simply because nobody else has really stood out, but he can't afford for his good moments to be offset by moments like that. • Another day, another bad Isaac Seumalo snap. This one was to Joe Callahan. • The Eagles ended practice with a Joe Callahan TD throw to Billy Brown. Brown did nothing in OTAs, minicamp, and the first few days of training camp, but he has turned it on a bit of late. • The Eagles didn't have their "A game" today, as previously noted, but the fans sure did. Over 40,000 of them showed up for this practice. Impressive. Aaaaaaand, now that I've sufficiently pandered to the fan base, I'm driving home now.